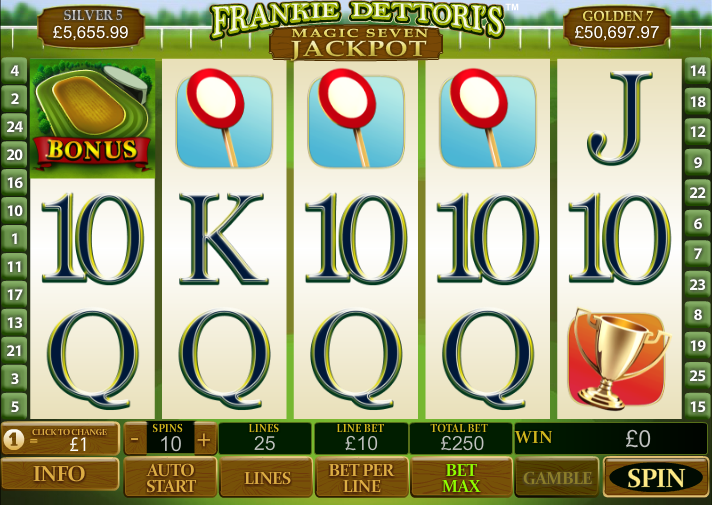 Frankie Dettori is a legendary jockey and personality, as popular off the horse as on it and it’s no surprise that an online slot machine to which he lends his name contains plenty of fun and excitement. Frankie Dettori’s Magic Seven is the name of this offering from the ever-reliable Playtech and if you’re wondering, the name Magic Seven refers to a 1996 race meeting at Ascot in which our hero won all seven races. 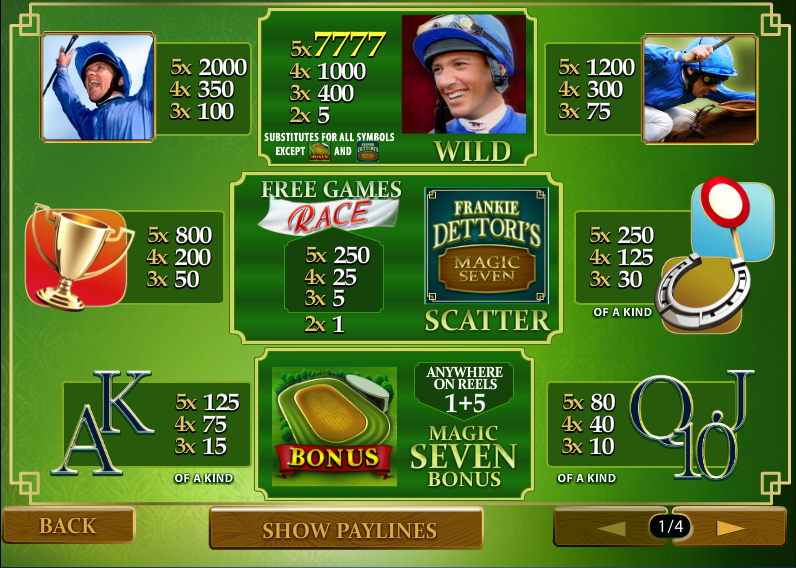 So this slot machine is a worthy attempt to pay tribute to Dettori’s amazing day and to bring some aspects of a day at the races to your slots experience. In this vein, the machine is a five reel, twenty five payline affair with a selection of horsey symbols. We have three different Dettori symbols, a winners cup, a finishing post, a horseshoe, a birds eye view of Ascot and a Magic Seven symbol. Face cards make up the rest. The birds eye view is the bonus symbol and if you spin this on reels one and five the bonus game begins; when the game starts you are presented with 20 spots on a racecourse and you’re given the chance to pick six. Each spot awards either a cash prize or a multiplier trophy – each time you reveal a trophy you’ll see a clip of Frankie’s big day. This being a game based on horse racing there is of course the opportunity to race for real; this is accomplished by spinning three or more Magic Seven symbols. You pick one of three horses and the race begins to win free spins; on my first go my horse came last but I was still awarded 10 free spins. A winning horse scoops 35 free spins while second place will earn you 15. A final feature is the opportunity to use the ‘Gamble’ button and it offers the chance to take a higher/lower punt on the dealer’s card. You can choose the amount to bet on the wager so you don’t have to risk everything. 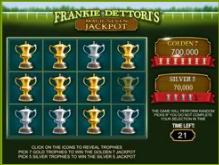 There are two progressive jackpots available – Golden 7 and Silver 5 – and entry into the game which wins them is random after any spin although the higher the bet the better the chance. You are guaranteed a win at this point so play the trophy picking game which appears to reveal gold or silver trophies to determine your win. Magic Seven is one of the simpler slots out there but it’s bonus features make up for any lack of panache in presentation. It’s quick and easy to play and a long-time favourite.